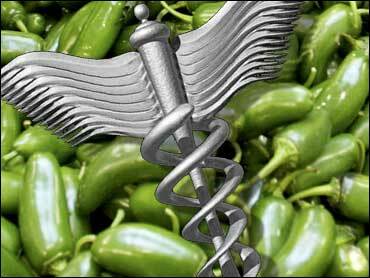 A natural chemical found in hot peppers may become a tool in treating prostate cancer. The chemical is called capsaicin. It puts the kick in jalapenos, habaneros, and other hot peppers. A study in Cancer Research shows that capsaicin thwarted prostate cancer cells in lab tests. Capsaicin prompted cancer cells to die and curbed tumor growth, the study shows. However, capsaicin wasn't tested on people. The experiments were done on prostate cancer cells, including those injected into mice. The researchers included H. Phillip Koeffler, M.D. He works at the University of California at Los Angeles and Cedars-Sinai Medical Center in Los Angeles. The researchers didn't feed hot peppers to mice. Instead, they used isolated capsaicin in their experiments, noting capsaicin's long use in food additives and drugs. Normally, cells live for a certain amount of time and then die. That natural process goes haywire in cancer. Cancer cells live way too long, giving them time to grow and spread. Koeffler's team found that capsaicin interrupted that chaos in prostate cancer cells by blocking a chemical called NF-kB. Normally, NF-kB is inactive, the researchers note. But in cancer, NF-kB becomes active, possibly due to DNA damage. Active NF-kB then filters into the command center (nucleus) of cells, hijacking operations to override the normal cell-death process, leading to cancer. Capsaicin sidelined NF-kB in Koeffler's tests. Capsaicin was also linked to lower levels of prostate specific antigen (PSA); high blood levels of PSA may signal prostate cancer. Cancer is complicated, involving more chemicals than just NF-kB. However, Koeffler's team says capsaicin is tolerable and should be tested in men with prostate cancer. Sources: Mori, A. Cancer Research, March 15, 2006; Vol. 66: pp 3,222-3,229. News release, American Association for Cancer Research. Reviewed by Michael W. Smith, M.D.